As part of evangelism job I speak to a lot of customer and try to tell them how they can use our controls. Couple of days back I was speaking one customer who was evaluating our RadControls for Silverlight suite and in particular was working with RadCartesianChart control. He saw all our demos of RadCartesianChart we ship and said that they all provide data from the code behind and are static in nature. They were looking for examples which tell them how to consume data from a WCF service and provide it to RadCartesianChart. 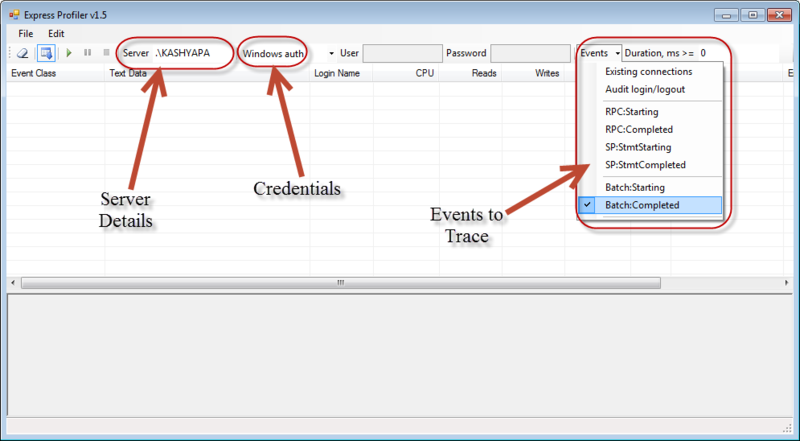 So this blog post is all about how do we provide data to ChartView from a WCF Service. So lets get started. 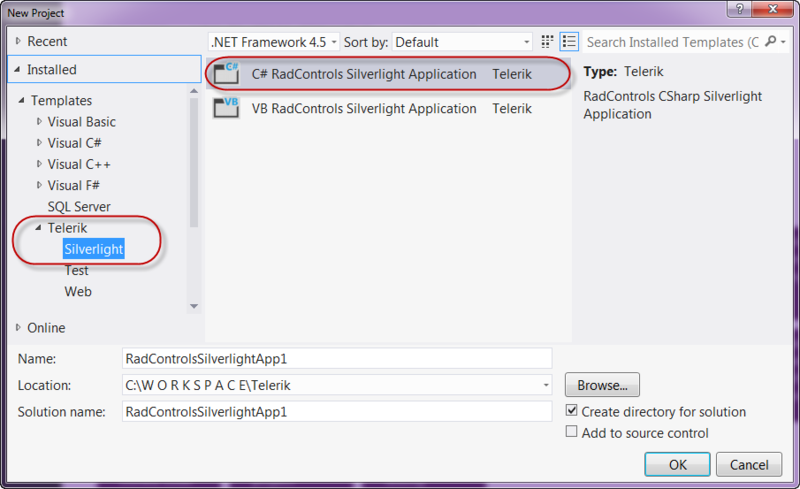 First thing to do, is to create a new project of type RadControls Silverlight Application. 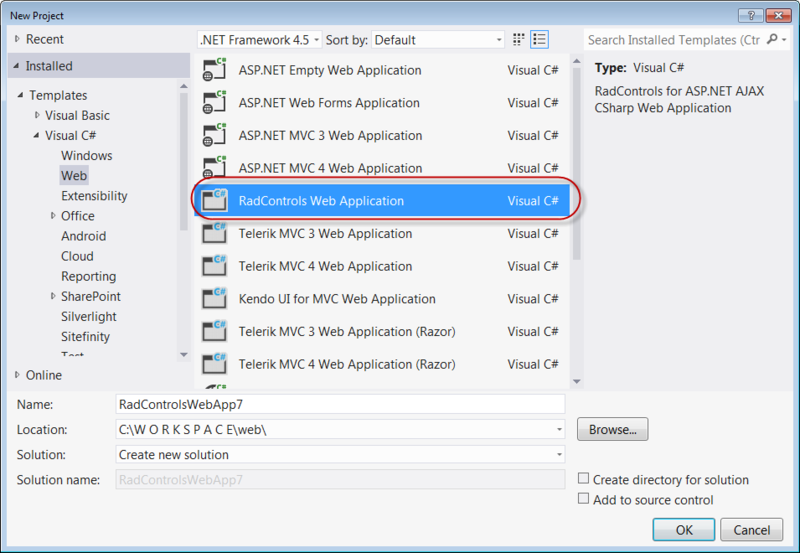 I am using Visual Studio 2012 for the rest of this blog post. You can do this in VS2010 too. Open Visual Studio IDE and select File > New Project. 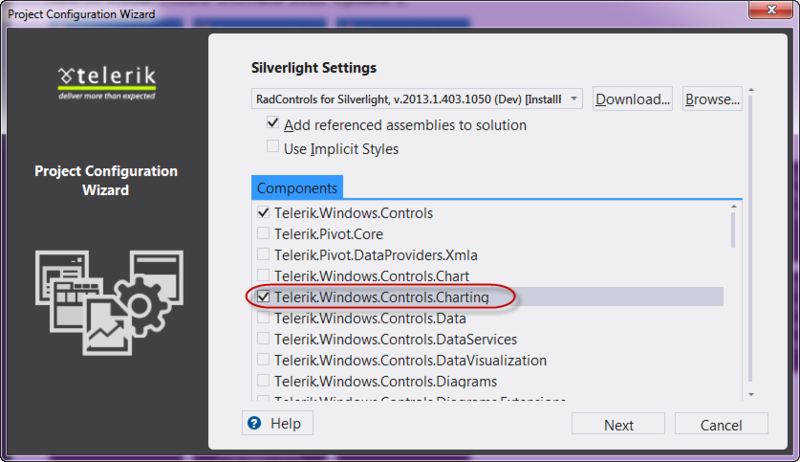 In the New Project dialog select Telerik > Silverlight > C# RadControls Silverlight Application. Give a name for the project and click ok.
Clicking next will take you to theme settings. 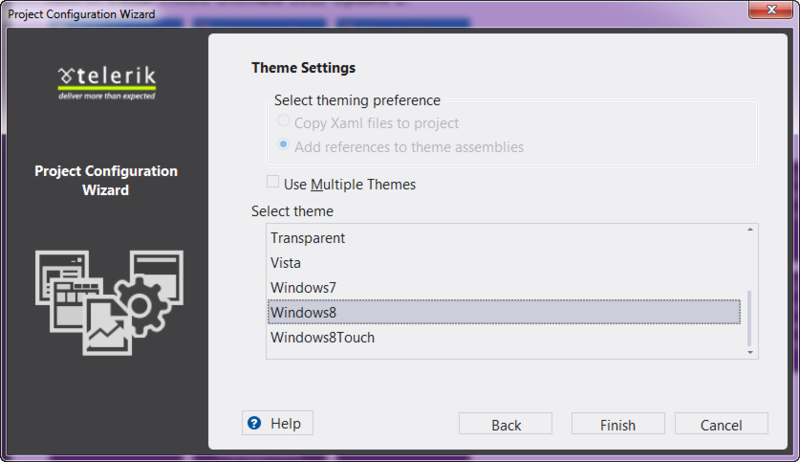 I am selecting Windows8 theme that comes out of the box. Click finish to let Visual Studio create the project. You can see that we have 2 projects in the solution. 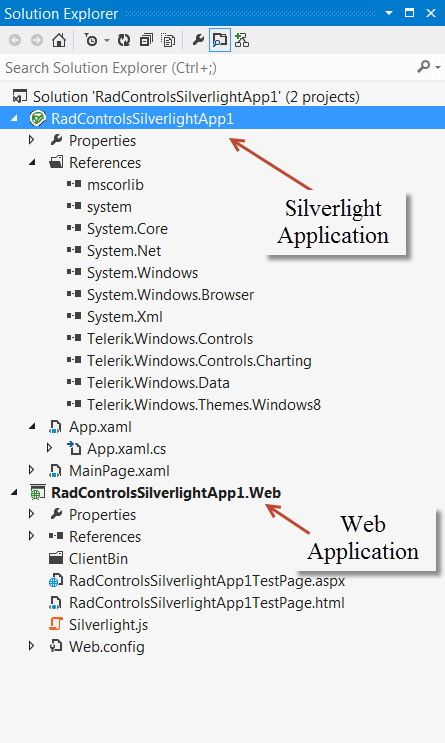 One is the actual Silverlight app and another is the Web app which will host the Silverlight XAP. 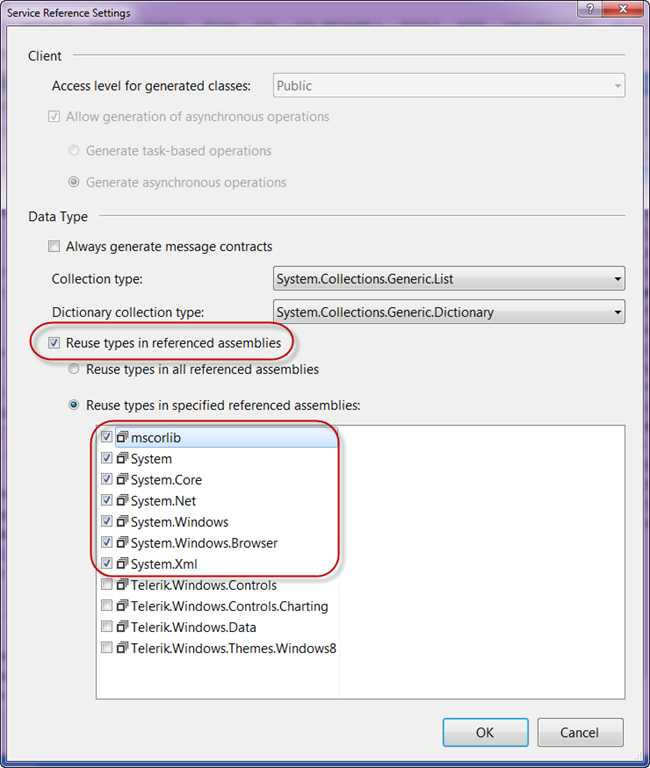 Next we look at how to create a WCF service. 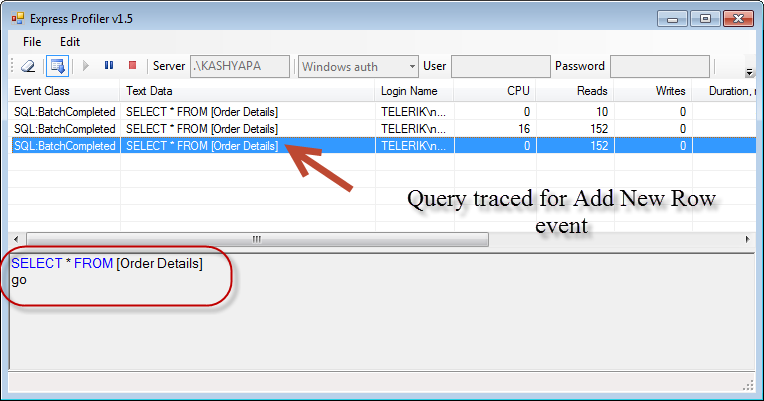 Create a WCF Service which will connect to Northwind Database. First create a folder and name it as Services. Right click on Services folder and select Add > New Item. 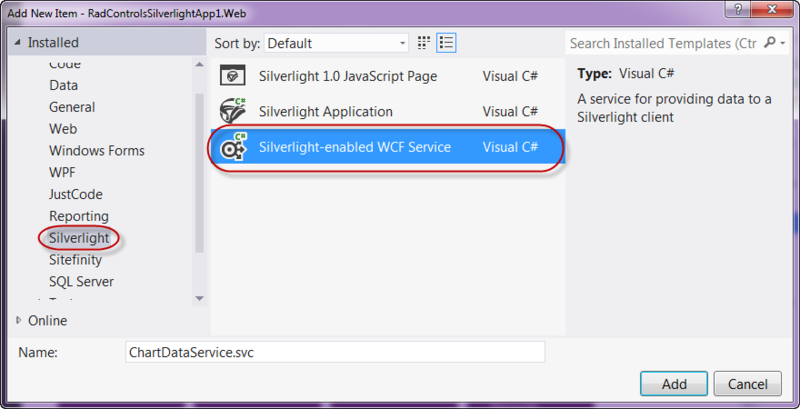 In Add New Item dialog, select Silverlight from installed templates and then Silverlight-enabled WCF Service. 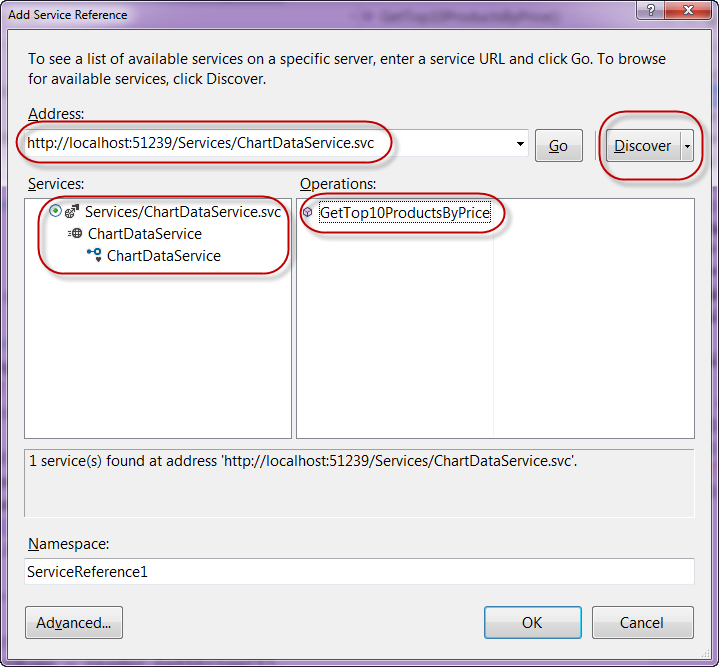 Lets name the service as ChartDataService.svc. Click Add to create the service. Next, since we need to connect to Northwind database, add a connection string to Web.config in the Web project. I have named my connection string as “NorthwindConnection”. Now that we have a service, next thing to do is to reference that service in our Silverlight application. 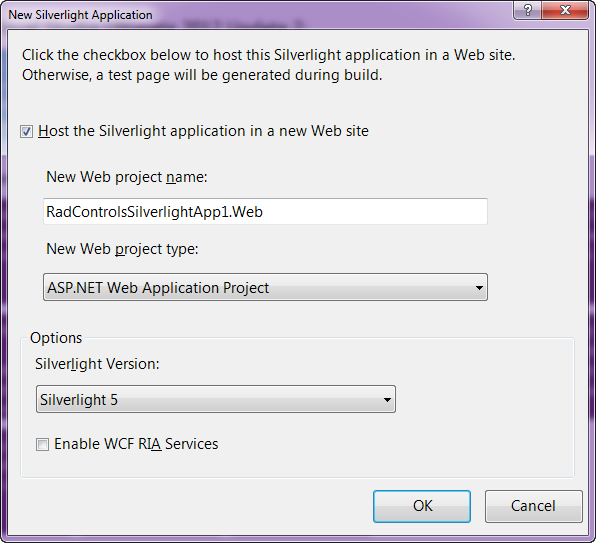 Right click on Silverlight application and select “Add Service Reference”. In the Add Service Reference window, click on Discover button. The WCF Service we created in the previous section will be automatically discovered and will list down the operation it supports. 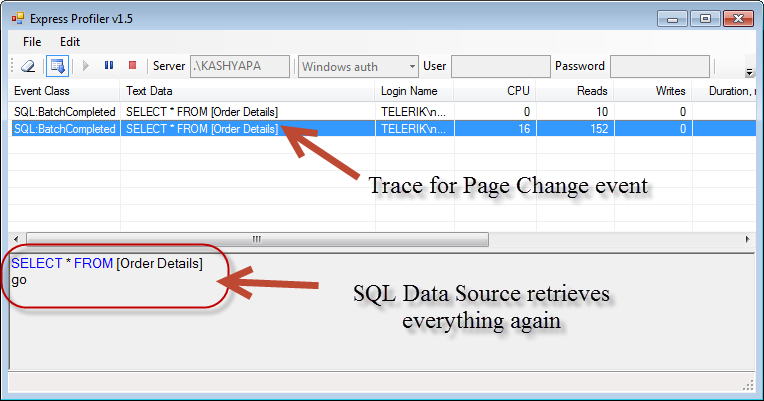 Clicking Ok will add a service reference in Silverlight app which can be invoked at runtime to fetch the data required for the chart. Lets take a closer look at the code. I first define the vertical axis and tell the chart that it’s a linear axis. I also set title to the vertical axis and call it “Price (USD)” because my vertical axis will hold the price of products. Next, I define horizontal axis and and tell the chart that it’s a Categorical axis. My horizontal axis will be used to represent the product itself, so setting the title of horizontal axis as “Products”. Now that we have finished setting the axis only thing left now is to create a series. So I define Series and create a BarSeries. I have given a name for the bar series and will use this name in code behind to perform data binding. We need to provide the data to the series – so lets set the ItemsSource to the Binding it will get at runtime. Now we need to tell what fields corresponds to the value of the series and what corresponds to the category axis of the series. 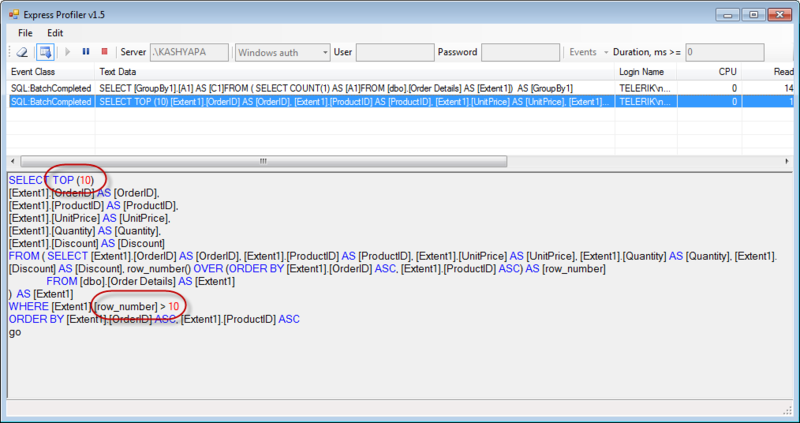 Set ValueBinding to “Price” field and CategoryBining to “ProductName”. As you can see we get our bar series graph which will show the price (in USD) on the vertical axis and products in the horizontal axis. We see the top 10 products by price. In this blog post, what I attempted was a very specific scenario which is most common on real world. As I said in the beginning, the customer I was talking to wanted to see an example of how to connect to a WCF Service, get data from the service and bind that data to Chart. So this blog posts outlines the steps required to make the chart work with WCF Service, Hope this is useful to many of you who may be having the same scenario. Do let me know your feedback if any.